Since the current Stormont is now more unpopular than the old one, many might wonder why you are trying to preserve it. Apart from being, in your own original terms, a partitionist parliament, it is now generally recognised as a failed political experiment in its present form. Since Peter Robinson last year described Stormont as unfit for purpose, you (with the SDLP) are now its most vocal supporter. Forty three years later, many people, Protestant and Catholic, are cheering the Ulster Unionists’ exit from Stormont government. Like unionism in 1969, some see you as defending a discredited institution, insisting that no one will force you out. You should not have to be forced out. Maybe you should leave now and use this opportunity to build a reformed Stormont. The longer you stay, the more credibility you will lose. You will, of course, disagree. 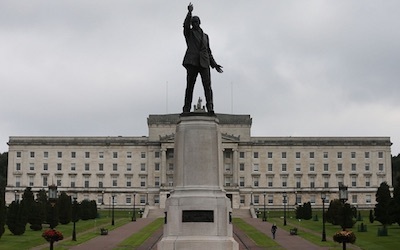 So what are the arguments for and against propping up Stormont? One reason for its retention is that it gives you power. Does it? Thirteen years ago Martin McGuinness abolished academic selection - a good decision. A few weeks from now over 7,000 children will sit one or both of two academic selection tests. Only Sinn Fein has held the education portfolio in new Stormont. So where is your power? What you have is not power, but limited negative control to curtail the limited negative control of others. There are many other examples of blocked progress: an Irish Language Act, the re-development of Long Kesh and the Education and Skills Authority. In one of the most shameful episodes in this state’s history, you were unable to censure Nelson McCausland for his handling of the Red Sky contract with the Housing Executive or to discipline DUP Special Adviser, Stephen Brimstone, for his behaviour towards a member of the Housing Board. Yes, you complained, but you failed to acknowledge that you helped to design McCausland’s escape hatch. Why should we be expected to live under such conditions? With the exceptions of Michelle Gildernew and Michelle O’Neill, ministerial ability in new Stormont could best be described as mediocre. (Maybe government here just needs more Tyrone women.) Administrative incompetence led to the failures to deliver the new police college, the A5 road and a redeveloped Casement Park. Meanwhile Stormont slept during the Nama sell-off. So if Stormont were suspended, who would notice? Your entry into government has made little difference to ordinary people. (Do you really think anyone cares who is principal deputy speaker?) If you disagree, explain for example, how Stormont has helped to reduce child poverty, especially in west Belfast. No one cares any more about talks and deadlines, or who is up for them in that artificial world of verbal ambiguity and political fudge. One person in five here is now on a hospital waiting list. Try fudging that one. A collapsed Stormont would give you the chance to build a new form of government - one built on non-sectarianism and normal parliamentary democracy with a government and opposition debating social and economic issues. Non-sectarian politics is the only path to a united Ireland. It would allow the redefinition of the Irish nation as including unionists, thereby extending your electoral potential beyond Catholics. Are you up for that - or can we expect the same old self-serving Stormont? If that is all you are offering, don’t be surprised if no one cares about Stormont or its eternal talks.